It is in next week that TUGA IT will be held from the 18 to the 20 at the Microsoft facilities in Portugal. TUGA IT is an event held in Portugal, together with several technical communities linked to Information Technologies with content of Microsoft technologies (Azure, Data, Office 365), Enterprise Integration, Development Methodologies (Agile, Scrum, Kanban), DevOps and much more. I was one of the selected speakers from a wide range of international and national speakers and thank you very much TUGA IT for having selected me 😃. I invite you to attend my session “Azure Web Apps again… Wait! It’s in Linux" Which is scheduled for the 19th at 11:30 am in which I will demonstrate the use of the Azure Web App on Linux. Yes you read well Azure Web App service is running 100% on Linux. Azure is cloud service distributed from Microsoft not only includes products of its own brand also includes products from other competing like Google, IBM, Oracle, Red HaT, Seagate, Suse and more. Invited to visit Azure Markteplace at https://azuremarketplace.microsoft.com/en-us to know the available services. You can consult the complete schedule at http://tugait.pt/2017/schedule-overview/. The first day is dedicated to Workshops from 10€ (https://app.weventual.com/detalheEvento.action?iDEvento=4175) up to 150 € there are still places available. You can consult the workshops available att http://tugait.pt/2017/workshops/. The remaining days are workshops and technical sessions. Or by the Community Card that I had previously announced at http://blog.en.rramoscabral.com/2017/04/tuga-it-how-to-get-free-tickets.html. I am very happy because I already have the Microsoft Architecting Microsoft Azure Solutions certification. "This exam is for candidates who are interested in validating their Microsoft Azure solution design skills. Candidates should know the features and capabilities of Azure services to be able to identify tradeoffs and make decisions for designing public and hybrid cloud solutions. Candidates who take this exam are expected to be able to define the appropriate infrastructure and platform solutions to meet the required functional, operational, and deployment requirements through the solution lifecycle." When consulting the Portuguese with this certification in the Microsoft Certification Profiles I noticed that there are not many and I was very happy. 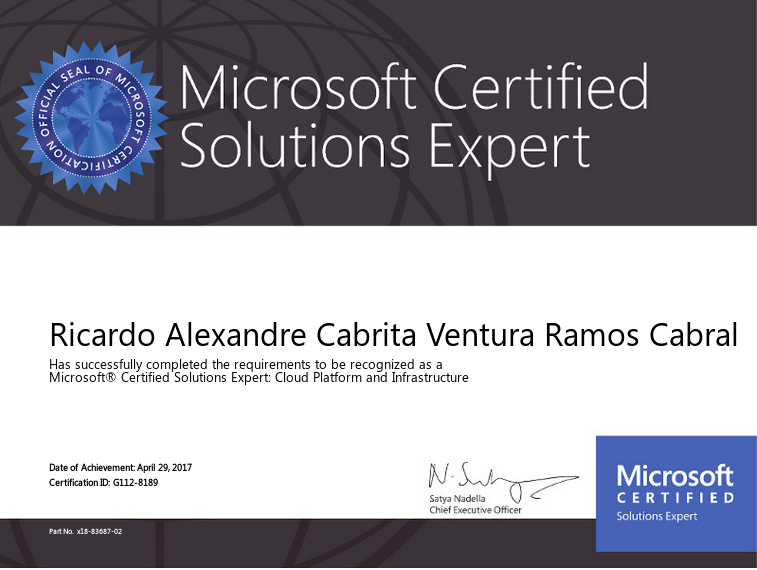 The best part is that I am too MCSE: Cloud Platform and Infrastructure because I already had the Developing Microsoft Azure Solutions and Implementing Microsoft Azure Solutions. 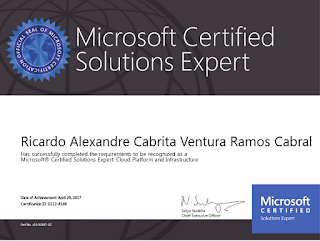 Microsoft Certified Solutions Expert (MCSE) certification: Cloud Platform and Infrastructure validates the skills needed to manage modern and highly effective data centers with expertise in identity and system management, virtualization, storage, and networking. Obtaining a Microsoft Certified Solutions Associate (MCSA). Obtain approval at one of the following elective exams during the calendar year 2017. Would you recommend someone to attend and take the Microsoft certifications?